Our travels in our bird, an 88FC35 1988 Bluebird Wanderlodge, Forward Control, rides 2, feeds 2, sleeps 2, get the picture? This year was another great year for Canada, the weather was great and our travelling companions were even better. This year we were accompanied on part of out trip by a couple of Blue Bird buddies and their coaches. Fran & I crossed the border at Port Huron and traveled up the eastern shore of Lake Huron, Our first night was near Goderich, ON we had visited Pointe Farms before and knew we would enjoy another night there again. Goderich was hit by a tornado on our last visit and with all the repairs and new construction the town like a different place. Next we visited Sauble Fall Provincial Park up on the Bruce peninsula for a couple nights before heading on up the eastern shore. We spent a night at each Killbear and Kilarney before making our way around to Little Current on Manitoulin, Island. There were no provincial parks so we stayed they Batmans Camp & RV Park, not a place we could recommend before we departed for Sault Ste. Marie to the KOA. The Soo KOA is spectacular and is well laid out and has just about everything you need in an RV park. It is also very close to shopping, restaurants on off the highway enough to make it nice & quiet. We did have a minor mechanical issue leaving Manitoulin, the bus did not want to shut off so when we got to the Soo KOA we had to get it to shut off so we disconnected the fuel shutoff solenoid to shut it down. After some assistance from Thomas & Jim we were able to get it functioning again so we departed on the rest of our trip accompanied by Jim & Nancy Brookshire and Thomas & Nancy Rembert. They had been staying on the US side of the border until we met up on the road to head on up to Wawa. Fran and I had been going there for years and our friends wanted to travel along so we shared a few of our back county spots with them. We stayed at the Wawa RV Park for a few nights and during the days we took the Jeep up to Steephill Reservoir and to the blueberry fields picking berries and hunting for mushrooms. Later we made our way over to Pukaskwa National Park near Marathon for a few nights and then on to Neys Provincial Park. Pukaskwa is a nice park and the campground there has plenty of large sites that will accommodate larger rigs & amp; buses but it should be mentioned that they are on a first come – first serve basis and have a 14 day stay limit. As with most parks in Canada they have hydro (electric) but are limited to 30 amp service so beware if you are a power hog. We know this and we watch our power consumption so not to trip a breaker. The parks along Lake Superior are great places to visit many offer sites near the shore or within a short walk, many offer access to dogs or may have a dog section so your pup can enjoy a romp in the waves. Hiking and scenic view trails are part of the experience and a great way to exercise. Traveling with friends is great and we enjoyed this trip more by having them along. Note: I highly recommend if you wish to do the Superior loop it is best done after Labor Day because their schools do not start until after the holiday and the parks are still pretty much full until then. This year we have not been able to travel as much as we would wanted to due to some medical conditions I developed this spring. So we pretty much stayed at home most of the summer but we did get away for three weeks in August and went to Colorado again this year. We also had the BIL with us and what a trip it was. John lives in Florida 5' above sea level so we got to take him with us on some hellish trails in the Rockies well above 13,000 feet. It was a time he will never forget. At one point he jumped out of the Jeep and kissed the ground thinking he had survived and had made it to the top of the world but his jubilation was short lived when we told him we had about 2 more miles and another thousand feet to climb. 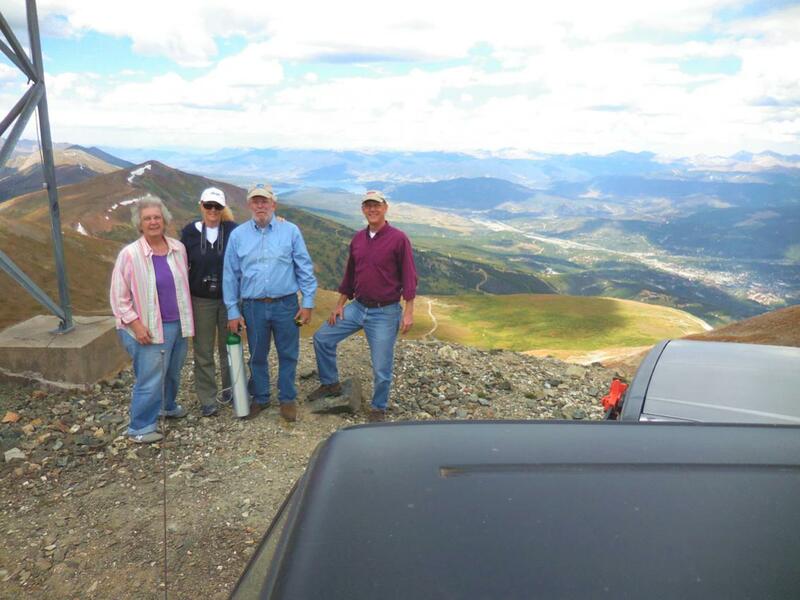 We traveled to Ouray, Telluride, Silverton, Leadville & Breckenridge Colorado this year to do the mountain trails in our Jeep and to once again be with our friends John & Nancy Hall. All in all it was another great trip, no mechanical issues this year I just had to keep my oxygen bottle handy and stay hooked up above 10,000 feet. Once I got down to around 8500 feet all was well again. No matter the health setbacks it was a nice trip, we saw pronghorn, moose, mule deer and eagles nesting this year. One surprise we ran into an extremely large flock of grazing sheep on one trail one day and looking down on them from 2000 feet above they looked like rocks in the grass but the closer we got to them we noticed it was grazing sheep. Traveling throughout the country you can see some beautiful sites but you can only see the true beauty by getting off the pavement and getting into the mountain ranges to see what is on the other side of that next range. Jeep trails are exciting, you can travel and see things you would never imagine, find old mountain passes once traveled by horse & wagon then followed by narrow gauge railroads once used to support the mining industry of the 1800's. When riding trails in a Jeep there are certain rules of the road or trail etiquette and I would advise anyone wanting to trail ride read up on the rules of the road so to speak so we all can have an enjoyable trip. There are those who want to take their mall crawlers, the never scratched Land Rovers, or their giant Hummers off road only to find out they are too big for the trail. Etiquette come into play when knowing who has the right of way on a mountain trail, so do a Google search and learn before you go so you won't get into a bind while out on the trails. Our next trip we hope will be in January when we can go back out to Quartzsite, AZ and find a few more new to us trails. 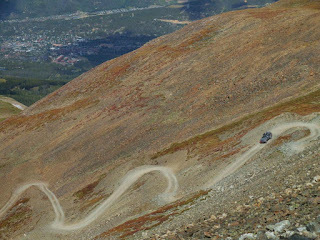 Picture #1 (top) coming up on Peak 10 near Breckenridge; #2 near Mosquito Pass near Leadville, #3 going down off Peak 10, #4 somewhere near Silverton, #5 Turquoise Lake near Leadville, #6 at an old transmission tower on Peak 10, #7&8 between Silverton & Telluride heading to Black Bear Pass. Well we got to hit the road again this year for the 3rd time and it was a blast, we spent 5 weeks on the road. We wanted to do this as cheaply as possible so we did stayed in several State and National Forest campgrounds. Our use of the commercial venues were kept to a minimum. 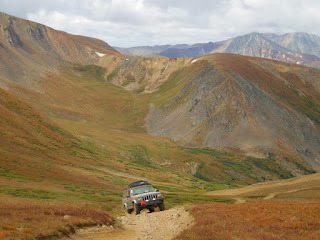 Colorado was our main objective, touring the old gold mining camps and doing some mountain trail 4 wheeling in the Jeep. There is something exhilarating about traveling on mountain ledge trails and riding above 13,000 feet in the Colorado back country. Encountering the three mountain goats was a treat of a lifetime. On this trip between the bus and the Jeep we traveled over 5200 miles in a five week period. No major problems, but we did have a blown airbag, got a load of bad fuel and had a broken hose clamp on the turbo intake of the bird, all was corrected and on with our trip we went. We visited several old mining camps, rode cliff ledge trails, saw mountain streams and waterfalls only accessible by Jeep or a suitable 4wd vehicle. Later on traveling to Moab to recapture the joys of a previous trip in March, then later on to the Grand Tetons, Yellowstone, and back through the Black Hills area of South Dakota was great. Seeing Bull Moose in rut and hearing Bull Elk calling for that special cow was a once in a lifetime event. Traveling to Colorado communities such as Frisco, Breckenridge, Leadville, Ridgway, Ouray, Telluride, doing the Monarch Pass in the bus and the Mosquito Pass, Georgian Pass and Imogene Pass in the Jeep was a thrill. Then heading north to the Grand Tetons, Yellowstone, and the Montana back country was very enjoyable. None of the Colorado trip or trails could not have been done without the help and guidance of our friends John and Nancy H. leaving Colorado was bittersweet but we moved on up to Moab to see more friends and to tour some sites that had left a lasting impression on us while we were there in March. Moab was too warm for us in September so we headed further north to the Grand Tetons and the Yellowstone National Parks. In the Tetons we ran into Keven, Brandyce, Jim & Barb more Blue Bird friends. In the Grand Tetons we paid $11.50 per night w/ electric, we saw the fall colors at its peak, we saw Bull Moose, Elk, Buffalo, Coyote, Wolf, Pronghorn, Mule Deer, and the American Bald Eagle. The Tetons were not as visible for us as they have been in the past but the fall colors and the crisp blue sky with the large puffy white clouds it was still a wonderful sight. A little late but: We had wanted to go to Moab for many years and for one reason or another we couldn't make it but this year we did. After our Quartzsite trip we left the bird in Tucson and flew home for about 6 weeks and went back in March. Well where do we go from here? Moab! Moab in March is nice and warm in the day and cool at night. We always wanted to get off the road and see what you read about in the off road magazines. Moab is a great place to visit and even a better place to explore, going off road is the only way to see the true beauty. Riding the highways you can see alot but to truly enjoy Moab you will need a 4x4 and not a Mall Crawler but a real beater of a Jeep. We did do some moderate 4 wheeling nothing extreme but we did drag bottom a few times but every bump, hump and jerk was worth every bit. Traveling up to Moab from Tucson was also a pleasure, above Flagstaff we went through Monument Valley and the Painted Desert, well worth the trip. Moab is on our return to list. If you have the opportunity to go with friends it makes it even better; we met 2 other couples there and we had a ball. Four wheeling is not too difficult, you could hire a guide, take a tour, buy a guide book and GPS but we had the pleasure to be with friends who knew the places to go from 17 years of experience of four wheeling in the area, we can't wait to do it again. They knew all the cool places and we felt safe. I would say Moab is not a place we would want to go during the summer months. It had been 3 years since I've been to Quartzsite and 4 for Fran; it took some serious begging but my girl gave in and went along for the trip. We departed home on 4 Jan 14, driving madly to beat an approaching winter snow storm. If we had delayed our departure by 12 hours we would most likely had to cancel our entire trip. So we headed pretty much due south to beat the storm. We travelled 2 days until it was warm enough to go without the heavy jackets. Our first memorable stop was Amistad near Del Rio, TX close to the Mexican border. At the visitor's center we check on the local sites and it was also suggested we visit Big Bend National Park on the Rio Grande at the Mexican border. Passports on board we were off to the Big Bend National Park. US 90 in west Texas is a great road for the views west Texas countryside and the peaks of the mountains across the border. Here is a shot of Fran in a hot springs of a former health resort on the banks of the Rio Grand. We spent 2 night in the park, went to Mexico via a roll boat for lunch one day and off again making our way to El Paso, TX then on to Tucson & Quartzsite. One of the things we enjoy most in Canada are the sunsets we are able to view from our campsite. This year we were able to expirience many beautiful sunsets. Each day the weather was just great, the daily temps were in the mid to upper 60's without a drop of rain until our last day. It was a good year spite the fact we were a little early for the blueberries and the mushrooms. A bad day in Canada is better than any good day at work. This year we ventured out beyond our normal excursion to Wawa, Ontario. We crossed the border at the Thousand Island area of New York heading to Quebec. We elected to return to Quebec, after a 12 years lapse it was time for a return visit. Our objective was to go up the James Bay Road to Chisasibi, Quebec, but that got changed due to a problem with our generator. We made it to La Verendrye Provincial Park and enjoyed the peacefulness of the park. French speaking Quebec was not much of a challange to us on this trip as it was 12 years ago. We found that the French were happy we were there, maybe the economy had some influence but it was a pleasure on this trip. La Verendrye is about 4 hours north of Ottawa and the road there was fair but not great, more than plenty of road construction was underway on this trip. We stayed 4 nights and our generator died on the 3rd night, I spent most of the fourth day trying to figure it out but I'm not a wrench turner so it was sort of beyond my abilities. We had planned to visit a client west of Ottawa to conduct an appraisal on his Blue Bird so off we went because we thought we were going to have to return home. Once we made it to Perth, our client & friend Jim Doel had a look and asked his mechanic Dave to check it out. Within 2 hours we had power again so we were on the road again. It turned out to be as simple as a bad generator start switch. The generator has 4 start switches and the remote control panel switch was the villian. We looked at the map and decided we would visit Algonquin Provincial Park. Algonquin to us was a lot of like being at Yellowstone here in the states, way too many visitors. As in Yellowstone if you want to see wildlife just watch for parked cars and the tourist on the side of the road. Three nights was enough for Algonquin, we stayed at the Campground of Two Rivers, it was nice, well appointed enough to meet our needs but way too many campers. We departed for Killbear Provincial Park near Parry Sound. This is a different story and one difficult for us to grasp. Killbear has a rattlesnake and it is on the endangered list so they have erected a 2 foot high fence to direct these snakes to an ecopass under the road so the snakes can travel freely; what not roadkill snakes? Hummm what about the snakes in the campground, lucky we never had to find out. Fran said 2 days was enough in Killbear so we were off to MacGreager Point Provincial Point another park on Lake Huron, for a couple nights then it was on down to Point Farms Provincial Park. Point Farms is north of Goderich, Ontario which got hit hard by a tornado last year while we were there. Goderich was nearly wiped out so we wanted to return to see how it was coming along with the rebuild. We were happy with the progress. Goderich will once again be the prettiest town in Ontario. We stayed 3 nights at Point Farms and when we left we headed to Elkhart, Indiana to look for a new fridge for the bus. Middleberry Indiana has a nice KOA if you are ever in the area and is only a few miles from Elkhart. Elkhart is always full due to so many visiters returning to the RV plants for service & warranty work. Shipshewana Indiana is another nice town you would have to visit and the Blue Gate Resturant is out of this world with authentic Amish cooking it is a must. Canada was a cool trip this year, we did something a little different. Of course we went to Wawa again but we took a different route. First we went to Frankenmuth, Michigan for a Blue Bird Rally where we had 21 Blue Birds and tons of interest from the other campers in the park. After our breaf stay in Frankenmuth we headed to the Canadian Border at Port Huron, MI with John & Nancy Hall fellow birders. John & Nancy own a 1988 PT40 and have owned it for 4 years and have nearly driven the wheels off it, they are like the rollin stones. From Port Huron we went up the Bruce Peninsula and stayed our first night in Canada at Point Farms Provincial Park near Goderich, On. Goderich is a cute little town midway up the peninsula and while we were there at the park a severe tornado storm hit the town and did alot of serious damage. Fran & I were at the beach in the park when we saw the water spouts heading toward the town, we got pelted pretty hard by hail; no damage to us but Goderich got hit hard. From Goderich the next morning we headed up to Tobermory, Ontario and stayed the night at Land's End RV Park, if we ever do the trip again we'll head to the ferry terminal and spend the night there for free. $62 bucks for a one night stay in a nowhere desitnation is a little steep no matter how cute the place may be. Our trip on the ferry was for only 2 hours but it was an adventure. From the ferry we traveled across Manitoulin Island and up to Canada 17 and headed toward Sault Saint Marie then on to Pancake Bay PP. Our onenight visit and PBPP was what we needed for us to push on to our Northwest Ontario getaway sight northwest of Wawa. Fran & I discovered this little mecca (Wawa) about 12 years ago and have been visiting it if only for a day or two for the last 11 years. Traveling the back roads, fishing, picking blue berries, hunting mushrooms and visiting our Canadian friends is what we do and look forward to it just about every year. This year was special because we got to share our special spot with our friends. Canada 2011 Trip. Click the link to view our photos, sorry for the order but I hope you enjoy our trip through our photos. The reasons for the name Bird Brains is it was an obsession for nearly 30 years before I was able to purchase our first Bluebird Wanderlodge. I call this our starter coach, but Fran says it is our only coach, time will tell. I will say this, in the spring of 09 Fran did tour another coach and came back telling me how much she enjoyed the layout of that coach. I see my plan is working already. In the next few weeks we will be heading to the Dakota's we'll be posting updates & photos of our journey. I love to scare the heck out of Fran, I told her this was our next motorhome! If looks could KILL!